An awesome video on EVE World PVP: http://www.youtube.com/watch?v=XrYe_4vHzgE. I'm a big fan of the game and think this is the ideal example of PVP, rich tactics used to wage giant non-instanced campaigns. This is actually a main point that we want to address in Mists of Pandaria. We want to make sure that open world PvP is being promoted to its fullest. We intend to make it so that players will not be afraid of engaging in PvP with the fear of being one-shot by an NPC guard. 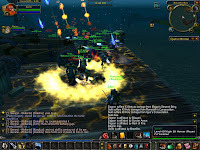 Hope that this is what you want to hear, as I cannot wait to get into some serious world PvP again." This is a step in the right direction, but I hardly think this is sufficient for "serious" world PvP. For "serious" world PvP, I posit that it needs to be a career. Players would have to be capable of character progression or earning wealth. There also needs to be more risk/consequences than WoW is willing to endure. motstandet you just described Eve Online. I've had some good times in Quel'Danas and Tol Barad and I wonder why Blizzard doesn't promote those types of areas more. World PvP helps the server community, generates player interaction and even makes good, consistent participants famous on the server. And it would be so easy to do! They already have TB. Just add new rewards to it every patch (that you can't just save up for buy straight up when the patch is released) and provide bonus incentives to fight enemy players. You're collecting tokens from quest rewards? Give enemy players killed in the zone a chance to drop a token. So simple, yet they don't do it on a regular basis. Blizzard can smell the wind changing, and Mists of Pandaria is all about confrontation and 'world'. More details are forthcoming, but I expect leveling to be full of PvP. They might even add in another TB-esque island. Unfortunately I anticipate them to fall into the same raid content routine once the expansion is underway.